My understanding is that the cv1 lenses are also NOT made of glass and are some sort of polymer? Im really worried that iso might react negatively with the polymer. Any confirmed cleaners out there? I have the similar experiance with 'God Rays' with the cv1. I tried using different micro cloth (new one of course) from my eye doctor. That seems clear out few effects. However, that doesn't solve the issue, where I can still notice the rays around my eyes when at a high contrast theme. Hope someone out there have better solution. I know that the God rays are just going to be there but after I cleaned it with the provided cloth they're quite a bit worse. I'm assuming that I just smoothed the smudges around the lenses and didn't actually clean them off. My eye doctor gives out leader lens cleaner. It is alcohol free and safe for use on all types of lenses and coatings. It does a killer job on my glasses which are not glass, and have a lot of coatings. I have also started using it to clean my computer and ipad screens. It's pretty darn good. Gets all oils off without a bit of streaking. I bet it would be fine for the rift's lenses, as it's specially designed to be gentle on polycarbonate lenses. Got a link to where I can buy this wonderful product? The CV1 lenses are indeed made of a non-glass material, and isopropyl alcohol is not friendly to plastics, so avoid that. The included microfiber cloth is safe to use, but with very little pressure. Scratches can result if dust is not removed before using the cloth, so I'm planning to use a puffer (like those used by photographers) to clear any dust, then lightly wipe with a towelette, and finally a very light wipe with a microfibre cloth if needed. You guys are sweet! Thanks a ton! I'm glad I asked before screwing up my lenses. I still have my lens wipe from the DK2, which was apparently very good at cleaning godrays. Combined with the lens wipe from the CV1, which is clearly very good are removing SDE, my CV1 stays tip top all the time. God-ray artefacts are the result of the fresnel lenses, there are no god-rays in DK2. And how exactly do lens wipes remove screendoor? Thus the bit in parenthesis. 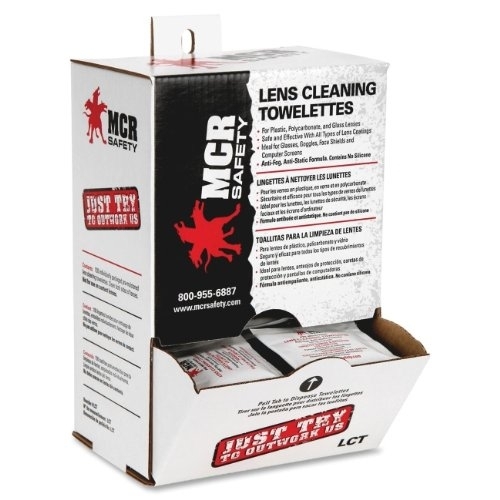 @RobHermans Have you use those lens cleaning towelettes? The anti-fog stuff I've used had an unpleasant smell - if the towelettes don't smell, great. I'm not in the US, so I don't have that exact brand (not available on AmazonUK). I use a similar product which does not have a strong smell, made by a company called Healthpoint Ltd.
@cybereality recommended them, so he could tell us whether they have a strong smell or not? The MCR wipes (and most I've used) have an alcohol-like smell, but it dissipates pretty fast, and I don't recall smelling it after waiting just a few seconds. Yeah I bought the ones RobHermans linked. Kinda expensive compared to the others but if they work in guess I don't really care how much they cost. That and that box will last me a long time and I really don't want to screw up my lenses. Thanks again for all of your great advice guys. Please add anything other advice you can think of. It looks like the main concern here is keeping the view clear, but what about disinfecting the lenses? I'd imagine someone could pass pinkeye or some other kind of infection along to the next user. Even the recommended towelettes say nothing about sanitation. There has to be SOMETHING out there that will keep the lenses hygienic!